Near the end of each month, the daily spreadsheets during the month will be available as a single compressed archive. When expanded, you can drag each spreadsheet file into your browser to view. They will behave exactly the same as if you had accessed it by clicking each individual calendar icon. Since these webpages are basically text files, they will be included in any desktop searches you perform, i.e., they will be found if your search phrase matches the phrase in any articles title. 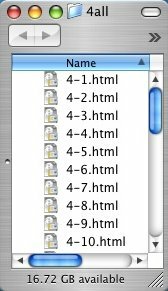 Ive found that if Ive also saved the article as a text file, it will also be automatically found in this search. By clicking on the SS link, I can instantly view the original article, but I can also easily refer to the corresponding text file to actually read the article most efficiently.